London, Dubai, New Delhi, Johannesburg, and more. Western qualities with a feminine approach. 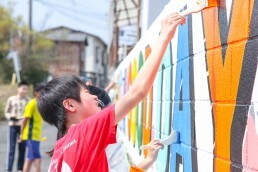 A Mural workshop by the street artist AIKO with local children. Co-sponsored by “bloom by 3rdplace”, Suruga Juuki Co.,Ltd., Sakura real estate Co,. Ltd.
“Tokaido Community Wall Project” is a project working with artists to create opportunities for experiences through art to all people, including people who are isolated themselves from the society or having some issues in their lives in the communities. 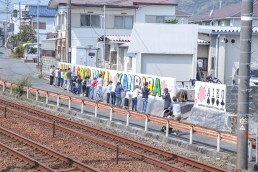 In the past, each post town on Tokaido was located as the important traffic points to connect east and west. We bring it as regional resources for connecting with people through art, and aim for a sustainable society where the art and society are “Living Together” within a community. We also aim to build up the regional identity and a vibrant community, and to increase people’s interest in history and culture through 6-post town and 2-pass on Tokaido by developing this project in the future.